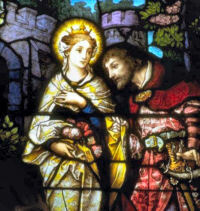 Father, you helped Elizabeth of Hungary to recognize and honor Christ in the poor of this world. Let her prayers help us to serve our brothers and sisters in time of trouble and need. We ask this through our Lord Jesus Christ, your Son, who lives and reigns with you and the Holy Spirit, one God, for ever and ever. Amen. Today the Church celebrates the memorial of St. Elizabeth of Hungary, religious. She was the daughter of Andrew II, King of Hungary, and wife of Duke Louis IV of Thuringia. She is famous for her great kindness and inexhaustible charity towards the poor and the sick. November 19 is the feast day of St. Elizabeth of Hungary in the Extraordinary Form. According to the 1962 Missal of Bl. John XXIII the Extraordinary Form of the Roman Rite, today is the feast of St. Gregory the Wonderworker, bishop and confessor. According to the Ordinary Form, St. Gregory's memorial is celebrated on September 3. Elizabeth was the daughter of the Hungarian King Andrew II. At the age of four (b. 1207), she was brought to the court of her future husband, Ludwig, landgrave of Thuringia. After her marriage in 1221, she very conscientiously fulfilled her duties both toward her husband and as a servant of God. During the night she would rise from bed and spend long periods in prayer. Zealously she performed all types of charitable acts; she put herself at the service of widows, orphans, the sick, the needy. During a famine she generously distributed all the grain from her stocks, cared for lepers in one of the hospitals she established, kissed their hands and feet. For the benefit of the indigent she provided suitable lodging. After the early death of her husband (in 1227 while on a crusade led by Emperor Frederick II), Elizabeth laid aside all royal dignities in order to serve God more freely. She put on simple clothing, became a tertiary of St. Francis, and showed great patience and humility. Nor was she spared intense suffering - the goods belonging to her as a widow were withheld, she was forced to leave Wartburg. In Eisenach no one dared receive her out of fear of her enemies. Upon much pleading a shepherd of the landgrave permitted her to use an abandoned pig sty. No one was allowed to visit or aid her; with her three children, of whom the youngest was not more than a few months old, she was forced to wander about in the winter's cold. Patron: Bakers; beggars; brides; Catholic charities; charitable societies; charitable workers; charities; countesses; death of children; exiles; falsely accused people; Franciscan Third Order; hoboes; homeless people; hospitals; in-law problems; lacemakers; lace workers; nursing homes; nursing services; people in exile; people ridiculed for their piety; Sisters of Mercy; tertiaries; Teutonic Knights; toothache; tramps; widows. Symbols: Three crowns (virgin, wife, widow); triple crown; roses; basket of bread and flask of wine; roses in a robe; infant in a cradle; model of a hospital or of Warburg castle; distaff. Often Portrayed As: Queen distributing alms; Woman wearing a crown and tending to beggars; Woman wearing a crown, carrying a load of roses in her apron or mantle. St. Elizabeth's daughter, St. Gertrude of Thuringia and her relatives Hedwig of Silesia, Agnes of Bohemia, Margaret of Hungary, Cunigund of Poland and Elizabeth of Portugal, were drawn to holiness through her example. Pray for the salvation and sanctity of your relatives. Love for the poor is characteristic of every genuine follower of Christ, those lacking the truth are the poorest of the poor, spend some time on a regular basis studying your faith (by reading or taking a home study course) so that you will be prepared to feed those who are hungry for the truth. Teach your children the Corporal and Spiritual Works of Mercy and give them practical examples. Have your children help you bake bread like St. Elizabeth and distribute some to your neighbors. St. Elizabeth is the patroness of the Franciscan Third Order (tertiary) and of all Catholic Charities. Find out more about what a third order is, particularly the Franciscan Third Order. See Nameday Ideas for St. Elizabeth, including dessert and symbols and prayers. Martini, Simone: St. Clare and St. Elizabeth of Hungary. Theodore, afterwards called Gregory, and from his miracles surnamed Thaumaturgus or Worker of Wonders, was of Neocaesarea in Pontus, born of parents eminent in rank and pagan in religion. At fourteen years of age he lost his father, but continued his education, which was directed towards a career in the law. His sister going to join her husband, an official at Caesarea in Palestine, Gregory accompanied her with his brother Athenodorus, who was afterwards a bishop and suffered much for the faith of Jesus Christ. Origen had arrived at Caesarea a little before and opened a school there, and at the first meeting with Gregory and his brother discerned in them capacity for learning and dispositions to virtue which encouraged him to inspire them with a love of truth and an eager desire of attaining the sovereign good of man. Fascinated with his discourse, they entered his school and laid aside all thoughts of going to the law-school of Bairut, as they had originally intended. Gregory does justice to Origen by assuring us that he excited them to virtue no less by his example than by his words; and tells us that he inculcated that in all things the most valuable knowledge is that of the first cause, and thus he led them on to theology. He opened to their view all that the philosophers and poets had written concerning God, showing what was true and what was erroneous in the doctrines of each and demonstrating the incompetence of human reason alone for attaining to certain knowledge in the most important of all points, that of religion. The conversion of the brothers to Christianity was complete and they continued their studies under their master for some years, going back home about the year 238. Before he took leave of Origen, Gregory thanked him publicly in an oration before a large audience, in which he extols the method and wisdom by which his great master conducted him through his studies, and gives interesting particulars of the way in which Origen taught. A letter also is extant from the master to the disciple: he calls Gregory his respected son and exhorts him to employ for the service of religion all the talents which he had received from God and to borrow from the heathen philosophy what might serve that purpose, as the Jews converted the spoils of the Egyptians to the building of the tabernacle of the true God. When he first took possession of his see Gregory accepted the invitation of Musonius, a person of importance in the city, and lodged with him. That very day he began to preach and before night had converted a number sufficient to form a little church. Early next morning the doors were crowded with sick persons, whom he cured at the same time that he wrought the conversion of their souls. Christians soon became so numerous that the saint was enabled to build a church for their use, to which all contributed either money or labor. The circumstances in which St Gregory caused Alexander the Charcoal-burner to be chosen bishop of Comana have been narrated in the notice of that saint on August 1; and his wisdom and tact caused him to be referred to in civil as well as religious causes, and then his interrupted legal studies came in useful. Gregory of Nyssa and his brother Basil learned much of what was currently said about the Wonderworker from their grandmother, St Macrina, who was born in Neocaesarea about the time of his death. 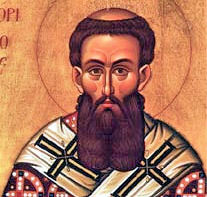 St Basil says that the whole tenor of his life expressed the height of evangelical fervor. In his devotion he showed the greatest reverence and recollection and never covered his head at prayer, and he loved simplicity and modesty of speech: "yea" and "nay" were the measure of his ordinary conversation. He abhorred lies and falsehood; no anger or bitterness ever appeared in his words or behavior. The persecution of Decius breaking out in 250, St Gregory advised his flock rather to hide than to expose themselves to the danger of losing their faith; he himself withdrew into the desert, accompanied only by a pagan priest whom he had converted and who was then his deacon. The persecutors were informed that he was concealed upon a certain mountain and sent soldiers to apprehend him. They returned, saying they had seen nothing but two trees; upon which the informer went to the place and, finding the bishop and his deacon at their prayers, whom the soldiers had mistaken for two trees, judged their escape to have been miraculous and became a Christian. The persecution was followed by a plague, and the plague by an irruption of Goths into Asia Minor, so that it is not surprising to find that, with these added to the ordinary cares and duties of the episcopate, St Gregory was not a voluminous writer. What these cares and duties were he sets out in his "Canonical Letter ", occasioned by problems arising from the barbarian raids. It is stated that St Gregory organized secular amusements in connection with the annual commemorations of the martyrs, which attracted pagans as well as popularizing the religious gatherings among Christians : doubtless, too, he had it in mind that the martyrs were honored by happy recreation in addition to formally religious observances. But he is the sole missionary we know of, during these first three centuries, who employed such methods; and he was a highly-educated Greek. A little before his death St Gregory Thaumaturgus inquired how many infidels yet remained in the city, and being told there were seventeen he thankfully acknowledged as a great mercy that, having found but seventeen Christians at his coming thither, he left but seventeen idolaters. Having then prayed for their conversion, and the confirmation and sanctification of those that believed in the true God, he enjoined his friends not to procure him any special place of burial but that, as he lived as a pilgrim in the world claiming nothing for himself, so after death he might enjoy the common lot. His body is said to have been ultimately transferred to a Byzantine monastery in Calabria, and there is considerable local cultus of St Gregory in southern Italy and Sicily, where he is invoked in times of earthquake and, on account of his miracle of stopping the flooding of the River Lycus, against inundations. *Alban Butler narrates the famous miraculous removal of a great stone, which in the Dialogues of St Gregory the Great becomes a mountain. When the feast of St Gertrude was to be added to the Western calendar in 1738 it was found that her dies natalis coincided with that of St Gregory. Clement XII thought that a saint who moved mountains should not himself be moved, even by a pope, and St Gertrude's feast was assigned to the 15th. Apart from what Gregory himself tells us about his relations with Origen, and sundry casual allusions which we find in the writings of St Basil, St Jerome and Eusebius, the information which we possess concerning this saint is of a very unsatisfactory character. The panegyric by St Gregory of Nyssa recounts many marvels, but says little of his history, and even less confidence can be placed in the Syriac life (the best text is in 'Bedjan, Acta Martyrum, vol. vi, 1896, pp. 83-106). Besides this there is an Armenian life and one in Latin both of little value. See also Ryssel, Gregorius Thaumaturgus, rein Leben und seine Schriften (1880) Funk in the Theologirche Quartalschrift for 1898, pp. 81 seq. Journal of Theological Studies for 1930, pp. 142. A valuable article by M. Jugie on the sermons attributed to St Gregory is in the Analecta Bollandiana, vol. xliii (1925), pp. 86-95. Here it is clearly shown that most of these attributions are unreliable, but Fr Jugie inclines to accept the authenticity of one of those preserved in Armenian, though he rejects that which F. C. Conybeare translated into English in the Expositor for 1896, pt s, pp. 161-173. Critics, however, seem generally agreed in admitting the genuineness of the panegyric of Origen, the treatise on the Creed, the canonical epistle, and the dissertation addressed to Theopompus this last only exists in Syriac. The greater part of the writings printed under the name of St Gregory Thaumaturgus in Migne, PG., vol. x, are either gravely suspect or certainly spurious. See Bardenhewer, Geschichte der altkirchlichen Literatur, vol. ii, pp. 315-332." Read some of the writings of St. Gregory the Wonderworker here. Read The Life of Gregory the Wonderworker by St. Gregory of Nyssa (lenghty introduction).